Dusting off that old photo album so you can relive your memories with your loved ones is a gesture that can make you feel cherished and loved. All filled with snippets of happier moments and times when we were in the utmost comfort, the photographs that fill our albums are those which remain with us for a long time. Moments pass; it’s the memories that live on. With these pictures, there are no worries of wiped memories and viruses corrupting the pixels. It is just the care we take when handling them, so they’re not bent or smudged. However, with time, elements around these pictures do take a toll on them. Suddenly, one day you open the album, and see dust swirling beneath the pages, threatening to turn the paper into mush. What can you do to keep the pictures in pristine condition? 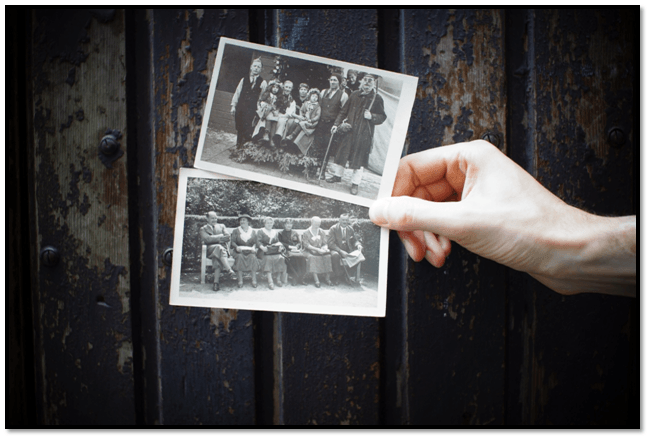 We provide information on protecting and preserving old photographs. How to properly protect and store old photos. We’re not asking you to keep your photos in a temperature-controlled room within Ziploc bags. But you need to understand the effect the environment can have on them. Storing your photos albums in the back of your closet might seem like a wise decision. But in this case, it is humidity and temperature that can cause the pictures to suffer. High humidity can cause the photo binder to become soft, making it vulnerable to damage, causing the image to deteriorate; low humidity can cause the binder to crack, since it shrinks. As for temperature, high rates can speed up the rate of deterioration, especially if paired with a high humidity. In this case, it is important to keep your photos in a place where they cannot be disturbed by light and can get their share of air circulation. Also make sure to keep the area clean. Paper fibers and gels for binders can attract insects and rodents. If you hold the picture between your fingers, the smudges will inevitably damage the photograph. When viewing your photos, whether they’re negatives or prints, keep them safe by holding them from the edges. Do not touch the surface. The natural secretions from your skin will cause damage overtime. This is why professionals use white cotton gloves when handling photos. With old photographs that have become fragile over time, use stiff paper to move them around. NEVER use aggressive materials such as adhesives or fasteners that might leave an impression on the picture. And this cannot be stressed enough; when you handle the pictures, keep them away from all food and drinks. Spills can leave irreversible damages. A little too late for that advice? We've got some of the best antique photo restoration artists in the world. Picture boxes made from paper or cardboard may look aesthetically appealing in your home décor, but they do very little to protect your pictures from the elements. The best way to keep your pictures safe is by keeping them in chemically-stable plastic sleeves and boxes that will protect them from harm. However, if you do not have the resources; opt for an acid-free cardboard box and add slips of acid-free paper to keep the pictures from sticking to one another. Storing your photos in proper albums will help keep your images organized, protecting them from physical and environmental damages. Ideally, your best bet is an archival-quality album which should then be stored in archival-quality boxes. Taking care of your old photos is a tough job, but not if you know what to do. However, if you do have any photos that have suffered damage, the best thing to do is to contact us for professional photo retouching services and protecting and preserving old photographs, so that your pictures and memories stay with you for a long time.